Goodreads Summary: In this high-action and romantic futuristic adventure, there is no escape from the future for two contemporary girls pulled out of their own time. I've been making an effort to give more sci-fi books a try, and this synopsis sounded intriguing. With time travel, a post-apocalyptic setting, and of course some romance, Erasing Time was a quick, enjoyable read. Sheridan and Taylor might be twins, but that doesn't mean they're exactly alike. Sheridan loves English and literature, while Taylor is into science. For the most part, they lead their own lives. But when they find themselves pulled 400 years into the future, Sheridan and Taylor have to band together to keep out of danger. Fortunately Echo, a wordsmith who specializes in the language of their time, is willing to help them. But the more Sheridan learns about Echo, the more she wonders if she can trust him. Does he really want to help them, or is he working for the Dakine who fight against the government? And can Sheridan and Taylor find a way out of the city before it's too late? 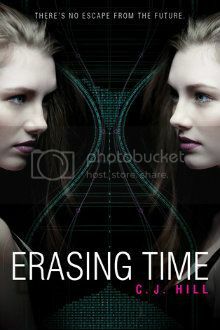 Erasing Time might seem to be a book about time travel, but it is much more than that. Time travel is only a small part of this book, and the way it is used is different than I've seen in other books. I appreciated that there was enough science to make the time travel believable, but not so much as to be needlessly confusing. Science continued to play a big role in navigating the future, and I have to say that I was jealous of Echo's computigating abilities. I also enjoyed seeing how C.J. Hill depicted the future, especially the language. Echo and those in the future speak a new English - which allows Sheridan and Taylor to create a "code" using twenty-first century slang. There are also religious and literary references throughout. Everything is so well integrated that the future seems real, and I had to keep reading to know what being in the future meant for Sheridan and Taylor. However, even though this book always kept my interest and was a quick read, it was definitely a world-building book. At times things seemed stagnant or like only the bare minimum happened. Although there are great interactions between the sisters, I wish that there had been more between Sheridan and Echo as the story went along. I had expected more to happen in this book, but now I have things to anticipate. If Erasing Time is any indication, this promises to be a good trilogy. I am looking forward to reading the next book!